Waited in to recieve proper absinthe glass, got ‘sorry we missed you message’, how!? Ah well, here we have Sebor absinthe from Czech republic standing at 55%. At first this is nice to drink but the second it leaves your lips you get a smack of bitter medicine. And it doesnt go away, if anything it hinders the next sips as well. ‘With wormwoood’, your not bloodly joking mate! At least you get a hazy louche. I cant get my head around why this exists. Looked into it a bit, brand makes it their own way, not using tradional distilling methods, yet still try to call it absinthe. Here we have Absinthe bitters, from Australia standing at 52%. Beautiful emerald colour. but thats about it. Now this one is actually quite hard to explain. As much as I want to say it is balanced, it is also quite boring. Everything is light. The flavours and aroma are subtle. I suppose you could say that this is a good absinthe for a first time try, but on the flipside it has no wow factor, no ‘Now thats why I enjoy absinthe!’ proclamation to others. Matsix christmas hat is cuteness. Anyways here we have Parisienne absinthe from La fee standing at 68%. Now this one I could smell from across the room. The main aroma and taste is a sweet liquorice with aniseed making its way in subtlely. But there not much else to it to be honest. Non oily and very clean finish, leaving little aftertaste. Here we have Jade Terminus Oxygenee, which also seems to be from France standing at 68%. Oh boy this one is strong, but has less of a aniseed kick to it, seems much more balanced than the previous one. Yet there is only a mellow (but seriously addictive) aftertaste with a pleasant warmth that lingers. Its very herby, a real smack of wormwood, sharp, clean, bitter enough and lightly lightly liquorice. This is going to sound odd but it is actually refreshing and I feel like I’m being spoiled. It is really good. We didn’t end up recording podcasts for the summer and autumn anime series (we were too busy actually going to Japan! it’s a hard life) so I wanted to write up some thoughts. Mob Psycho 100 was one of my favourites of the summer season. Originally written by ONE (probably best known for One Punch Man) and the animation has kept the rough style. Mob works for the blonde guy above. He has a knack for dealing with the supernatural. Which his employer does not. Which is bad as the guy claims to be able to deal with any spirit. But this is merely side dressing for the series. It’s more about Mob coming to terms with his abilities and the people around him. 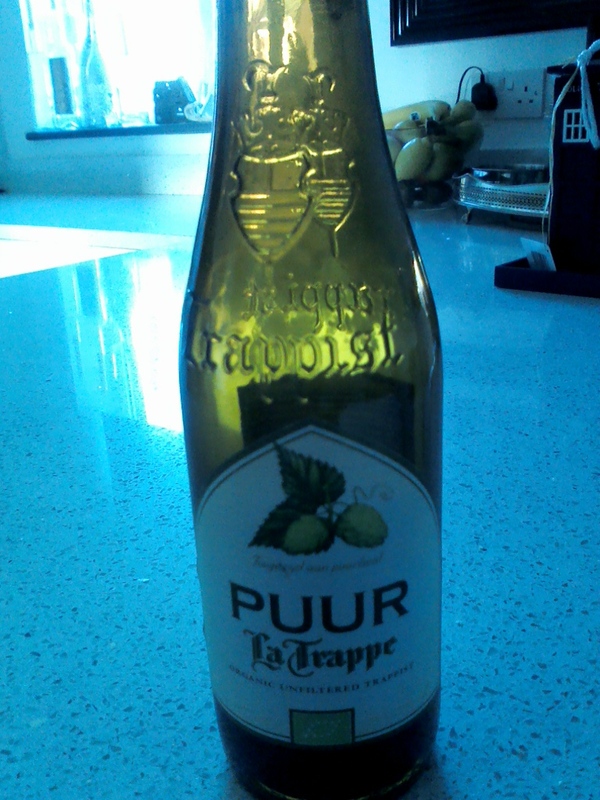 Here we have Puur la trappe from Koningshoeven brewery standing at 4.7%. The aroma was nothing but hops. While thankfully the taste was indeed hoppy but a lot more balanced, with a light sweetness and bitter. Way more drinkable than I expected.